Japan is a global innovator when it comes to many things-- cars, electronics, planet-destroying robots, the list goes on. However, one thing where it falls short is, surprisingly, healthcare. No one takes sick leave. Back in the states, when you get sick enough, you just don't go to work. No one wants to catch your nasties and anyway you're effectively useless unless your job is to sit around, look miserable and complain. So you just call in, take a day of sick leave and get better. Not here. If you're sick, you go into work, no other option. We don't even have the option of taking sick leave because it doesn't exist. What if your arm gets chopped off in a ninja ambush? You take your paid holiday leave until the bleeding stops. I'm not kidding. If I had wanted to stay home this week to ride out my sickness, counting today which makes day 4, I would have consumed 20% of my paid vacation for the year. Looking forward to a trip home during the summer? Forget it! You caught a cold! 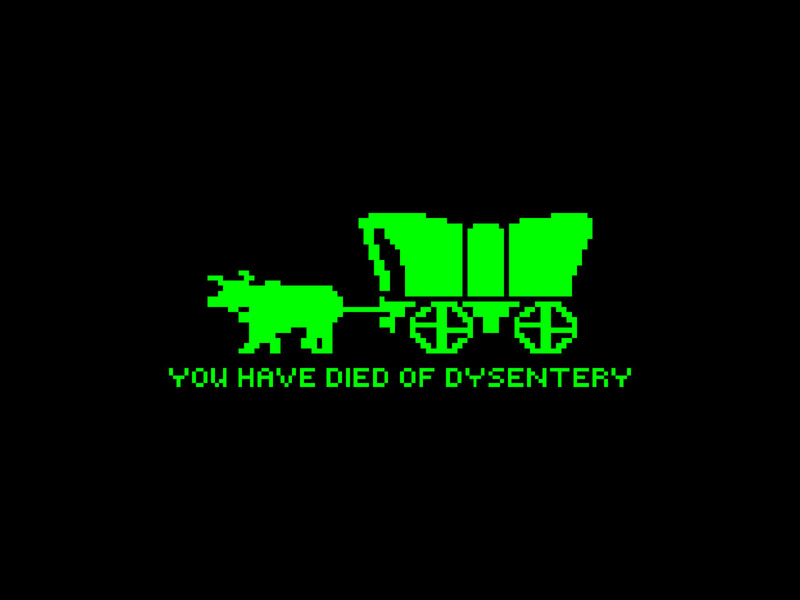 May as well have caught dysentery on the Oregon Trail. You think the face mask is your ally? I was born in it! But not cautious enough to actually do anything crazy like heat an entire building evenly or stay home when you're sick. They sent me to the hospital yesterday. A collective gasp of fear just went up from my western audience. "Oh my God did you hear?! Spencer was so sick he had to go to the hospital! Do you think they'll send his body back to America and if so who has to pay the shipping?!" But it's not like that. It's standard issue to go to the hospital when you have a cold. In fact, like in America, it's one of the only ways to get off the hook and not use vacation time to stay home from work (if your job even allows you to take unpaid leave). I guess I should preface this by saying that I'm terrified of Japanese hospitals. The last time I was in one they took so much blood out of me I almost passed out-- and with a syringe that had a needle like a firehose. Some of you are now assuming that I either pass out easy or have never had blood taken before so I was just naturally shocked. FALSE. I've had blood drawn plenty of times back in the states, but never with a turkey baster. The worst part is the powerlessness you have over the whole situation. You can't communicate and have no idea what they're going to do next. Before I always liked to shoot the breeze with whoever was lancing me, but the whole process takes on a distinctly horrific tone, like being prodded by aliens. Not because Japanese hospitals or nurses are particularly alien-like, but because you're sitting or laying there and you know they're talking about you and deciding what to do next or making bets or something and you have no choice but to go along with it. I'll give you another example. Yesterday I went in to get my disease evaluated with someone from my school with a little English. We got me checked out (listened to my lungs, looked in my mouth, took my temperature) and then he was like, "Well, you have a cold (surprise!). Since you haven't eaten today, we better put you on a drip." This time I was like, "Oh, nuh uh. No way. You keep your distance with those needles. I don't want anything going in or coming out of me through a needle." I was able to persuade them that I would eat and that I was fine and they cut me loose without putting me on a drip, mercifully. But thank goodness I had someone there to explain to me what was going on. With that said, the visit was super cheap at 10 bucks and the medicine they gave me was 5. Although it's really just a cough suppressant fever reducer pill I probably could have bought at Rite-Aid stateside. So yes, being sick is awful. But at least the folks around me tried to help me out! I had someone bring medicine to my apartment, I was sent home with a large jug of Aquarius water (think Gatorade) and someone from school tried to buy whatever food I wanted to eat for me. My supervisor checked up on me in the evening and called me before school to see how I was. So I was well looked after. Nevertheless, I'm looking forward to putting this cold behind me and eating a lot of oranges. A loooot of oranges.